June will be a month of great commitment and responsibility. To succeed and achieve your goals, the phases of the Moon allow you to be inspired and prepare for what lies ahead. With the rational side in evidence, assertive decisions and productive conversations can be observed. Want to know what else the moon has to reveal? Be sure to follow the forecasts. 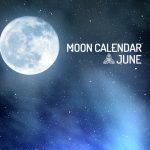 Next, check out the lunar calendar for June 2019 and discover some tips and recommendations for each phase. Take the time to get organized and prepare for this month, based on the lunar cycle. Under the New Moon, June 3rd must be marked by a sense of commitment, where you will probably feel overwhelmed by the need to take responsibility and to make clear choices. All this rigidity may culminate in conflicts and confrontations with figures of authority. Despite the risk of clashes, clarity and commitment are great behaviors during this lunar phase. That’s because the New Moon represents a cycle of restarts, where the will to accept new challenges becomes more evident – and the chance for victory is even greater. On the 10th day, the First Quarter moon is up in the sky, bringing with it moments alongside the family, home and possible love. The relationships will be in a light, but almost superficial and rational. Enjoy this moment of realization of plans and ideas. If you are starting to get involved with someone, it may be interesting to actually know that person rather than engage in sexual matters. In all aspects of life, make use of all the rationality provided by this period to have more stable and lasting results. Day 17, the Full Moon of the lunar calendar for June comes up with the ability to break that rational side a bit. Not for nothing, since this lunar phase is known by the energy moved by emotions, softening the hearts and making people even vulnerable because of this. Continue to chart your initial plans, but learn to prioritize that week. Whatever requires you to be calm, stable, and focused should be done with increased attention, for there is the possibility that your heart may take over decisions. Love will be graced by the Full Moon, and it can be lived intensely, in its most beautiful and romantic form. Enjoy the period to strengthen loving and family relationships. June will demand a lot from all of us, and from the 25th, the Last Quarter Moon comes up to warn us that it’s time to slow down. All the intense energy that has circulated during the previous phases now tends to decrease, and you should review all of the plan goals you drew during the month. Are they completed? Are you satisfied? What would you do differently? Relax, clear your mind, rest as much as you can and prepare for the arrival of a new phase filled with challenges. June will be a month marked by much rationality, and thirst to achieve goals. By combining reason with intuition and goodwill, the results will be fantastic – it will all depend on your commitment and the way you relate to the people around you. You must have realized that, during this month, your rational side should prevail over your body and mind. In relationships, loving or not, you will be reflective and willing to talk. However, there may be times when your mood is unsteady and you tend to dramatize things a bit. Overall, June will be a good month to fight for your goals and even impose your values ​​to some extent. There is a lot of energy for you to make the best decisions, constructive and with a lot of responsibility. Looking for the calendar for another month?